Saturday September 13 As usual, rather more work to do, cleaning up in sitting room &c - for good sweeping, I finished little job for Mrs Howe to stitch for me. Rose in awhile in P.M. Mrs H_ in also to see the new military dress-suits. They having arrived with past week. I took grapes in to Mrs Howe. Maz S_ in of errand in P.M. Sunday September 14 Unpleasant foggy & not "frosty" as had expected. 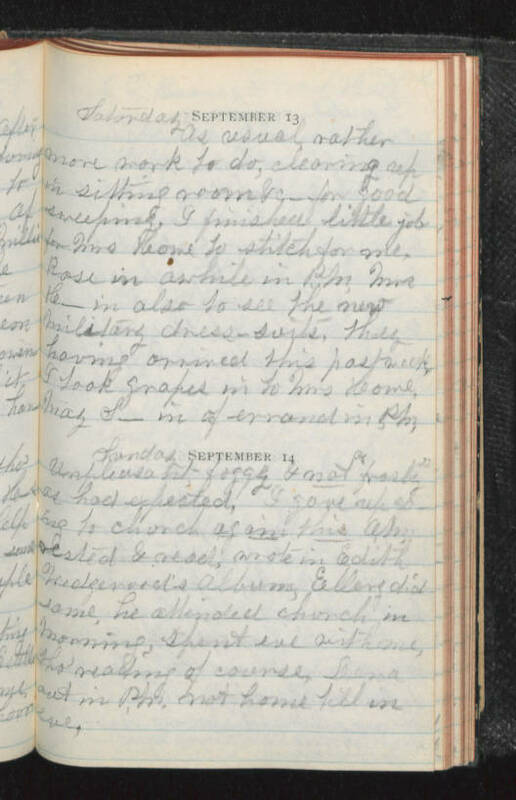 I gave up going to church again this A.M. rested & read, wrote in Edity Wedgewood's album, Ellery did same, he attended church in morning, spent eve with me, tho' reading of course, Lena out in P.M. not home till in eve.